French cheeses are stunning in their variety and unparalleled in their quality. There are well over 300, and some say close to a thousand different kinds of cheese in France. To help us keep track of all this cheese, the French like to divide it into eight categories, known as les huit familles de fromage. To build a foundation for truly appreciating the mind boggling number of varieties available, it is a good idea to start by learning a little about how cheese is made and the different types of French cheese. Blue: Bleu de Bresse, Roquefort Cheese. Learn more about French blue cheese. Some French cheeses are protected by an AOC (appellation d'origine controlée), which guarantees a quality product made according to strict regulations. These cheeses seem to naturally garner more attention than their non-AOC brothers, many of which are surely worth trying. 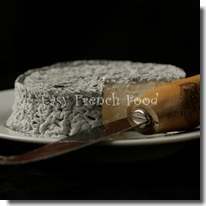 Nonetheless, you can get a good feel for the tradition of cheese in France by having a look at the AOC list of cheeses. The history of cheese making in France is long and fascinating. Roquefort and Cantal vie for the position of the oldest cheese, and both date back several thousand years. Learning the fascinating and colorful stories that accompany French food will add to your pleasure when you sit down to enjoy a meal. Of course not all of French cheese could be considered a gourmet experience. Two of France's most well known cheeses are Boursin, an herb and garlic flavored cheese spread, and Laughing Cow Cheese, a highly processed and virtually flavorless cheese. Sauce Mornay - Used to top vegetables, crepes, and all sorts of baked dishes, a creamy cheese sauce recipe. Sauce Roquefort - Absolutely divine with steaks, a very quick and tasty blue cheese sauce recipe. Gougeres - These are savory cream puffs made with a sprinkle of cheese and eaten as an appetizer. Aligot - Made with great fanfare in the Auvergne region of France, these are essentially cheesy mashed potatoes. Brie en Croute - Adopted with enthusiasm by hosts around the world, cheese is warmed in puff pastry for these baked brie recipes. Croque Monsieur - Dipped in egg and fried in butter, this is a grilled cheese sandwich recipe. Some of the most popular cooking cheeses in France aren't French at all. Gruyère, which is fabricated in the neighboring country of Switzerland, makes frequent appearances in French recipes. The Italian cheeses Mascarpone, Parmesan, Mozzerella, and Ricotta are also employed freely in French cuisine. Many people wonder about how to store cheese. If you are lucky and live in France, you can enjoy non-pasteurized cheese, which should not require refrigeration. Rather store it in its wrapper in a cool and airy spot. All other cheeses should be wrapped in wax paper or plastic wrap and stored in the refrigerator. There are a few rules you should follow when serving cheese. It should almost always be served at room temperature, so it is best to take it out of the refrigerator before you sit down to eat if you are planning on a cheese course after the main dish. Try doing like the French, and alwlays serve an odd number of cheeses.